Originally Native Americans used this route to portage their birchbark canoes across the Island, from Chippewa Harbor to McCargoe Cove. The Civilian Conservation Corps built this trail in the 1930s, and today the northern portion from Lake Richie to McCargoe Cove is frequently used by anglers, hikers, and canoeists. Not as many hikers travel along the southern portion, because it dead-ends at Chippewa Harbor. 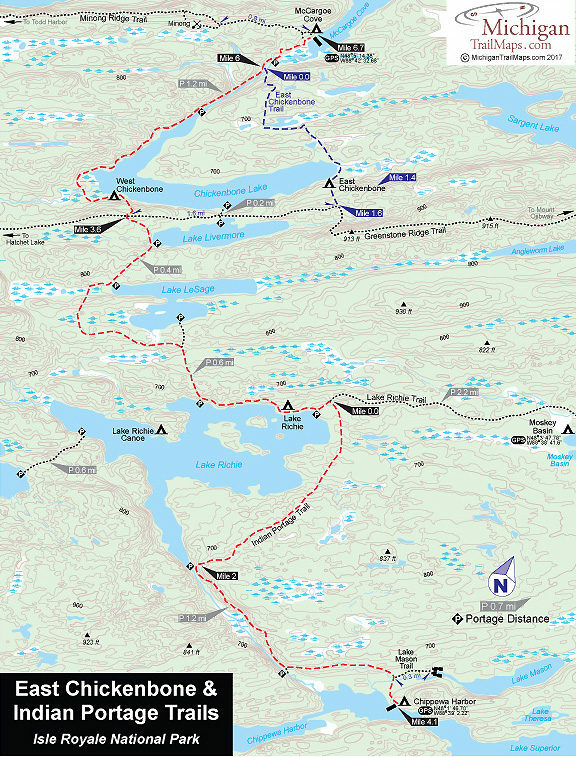 Most hikers arrive on either the Greenstone Ridge Trail or the Rock Harbor and Lake Richie Trails and head north or south on Indian Portage at this point. Originally Native Americans used this route to portage their birchbark canoes across the Island, from Chippewa Harbor to McCargoe Cove. The Civilian Conservation Corps built this trail in the 1930s, and today the northern portion from Lake Richie to McCargoe Cove is frequently used by anglers, hikers, and canoeists. Not as many hikers travel along the southern portion, because it dead-ends at Chippewa Harbor. The path traverses just about every type of terrain found in the park. Along the way you will pass lakes, swamps, and beaver ponds. You will climb ridges and pass through dense forest and sections still scarred by the 1936 fire. 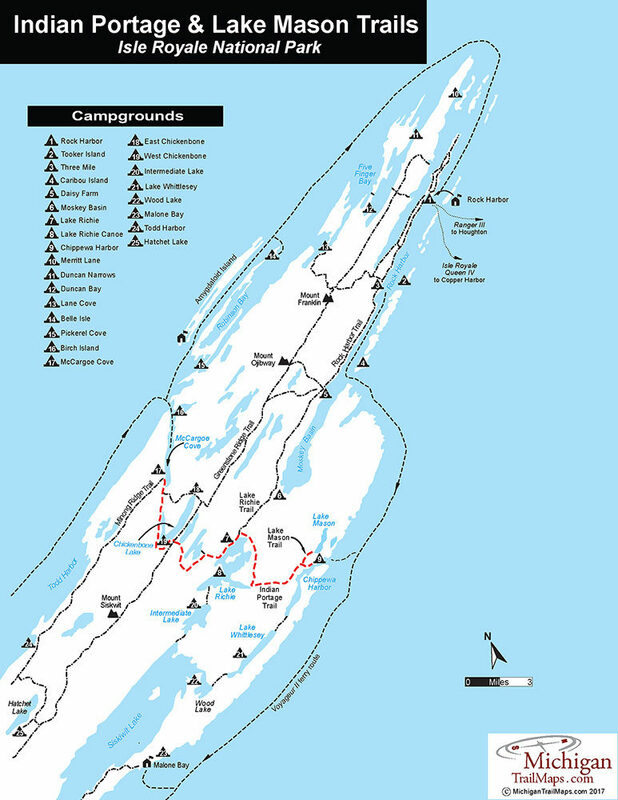 Most hikers arrive on either the Greenstone Ridge Trail or the Rock Harbor and Lake Richie Trails and head north or south on Indian Portage at this point. But you could also utilize the Voyageur II to be dropped off at either end of Indian Portage Trail at Chippewa Harbor or McCargoe Cove. From the Lake Richie Trail junction, the Indian Portage Trail heads west and then north to McCargoe Cove, reaching the picturesque campground in 6.7 miles. Along the way you cross the Greenstone Ridge Trail and shortly after that reach West Chickenbone Campground. Heading south from Lake Richie Trail, Indian Portage Trail reaches the tip of the south arm of Lake Richie and then follows a bluff above the lake’s drainage to Chippewa Harbor, reaching the campground in 4.1 miles. 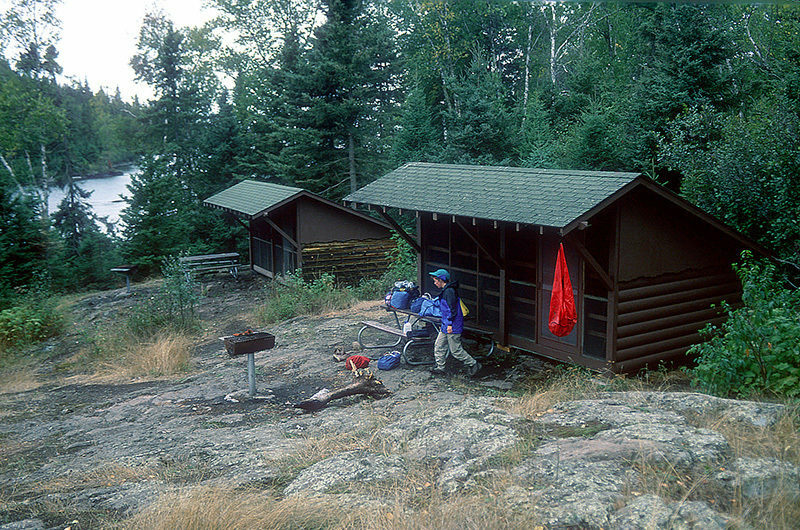 Chippewa Harbor Campground is another favorite for hikers because its four shelters are situated high above the water, with a good view of the harbor. The narrow entrance from Lake Superior, surrounded by rugged bluffs and small islands, is especially beautiful. The campground also has individual and group campsites, pit toilets, tables, and a dock. Right before reaching the campground, the trail passes the side trail to Lake Mason. The side trail takes about 10 minutes one way and is an easy 0.3-mile walk to the rock bluff that overlooks the west end of the lake. 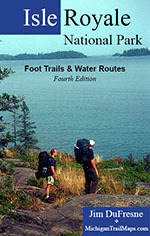 The Indian Portage & Lake Mason Trails is covered with detailed maps in Isle Royale National Park: Foot Trails & Water Routes by Jim DuFresne. To order the 184-page guide to the wilderness island, Click Here. Shower tokens, clean towel, and a bar of soap can be purchased at the camp store at Rock Harbor or Windigo. Some backpackers like to book a room for their final night at Rock Harbor, either at the lodge or in one of the housekeeping units that can be shared by six people and feature small kitchenettes. For reservations, contact the park concessionaire, Forever Resorts (866-644-2003 or 906-337-4993 in summer; www.isleroyaleresort.com). In the Upper Peninsula, on the way to Isle Royale National Park, the best place to pick up equipment is Downwind Sports which has two stores at 514 N Third St. in Marquette (906-226-7112) and 308 Shelden Ave. in Houghton (906-482-2500). Once on the island, information, maps and backcountry permits can be obtained from the Rock Harbor or Windigo Visitor Centers at the foot of the ferry wharf. There are also small stores at each entry port with limited and very expensive supplies. Isle Royale National Park opens April 16 and closes on Nov. 1 to all visitors for the winter. The park has an entrance fee of $7 per person per day or an annual pass for $60. You can pay the entrance fee once you arrive at the park or in advance at pay.gov and avoid congestion and long waits on the island. All park visitors who plan to camp overnight at campgrounds or cross-country sites are required to obtain a camping permit. This permit can be obtained free of charge at the visitor center at Windigo or Rock Harbor. 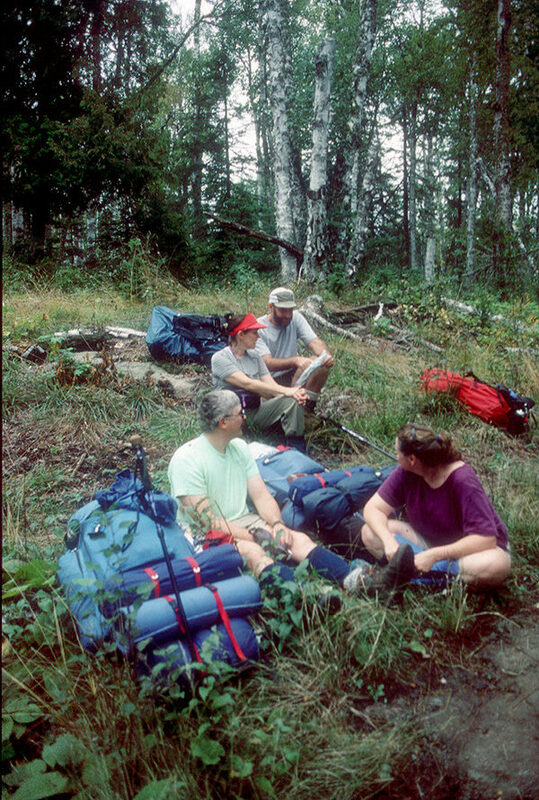 Most hikers reach Indian Portage Trail via the Greenstone Ridge Trail or Lake Richie Trail. You can also be dropped off at its north or south end by the ferry Voyageur II. Contact Voyageur II to find out current schedule and costs of its water taxi service.